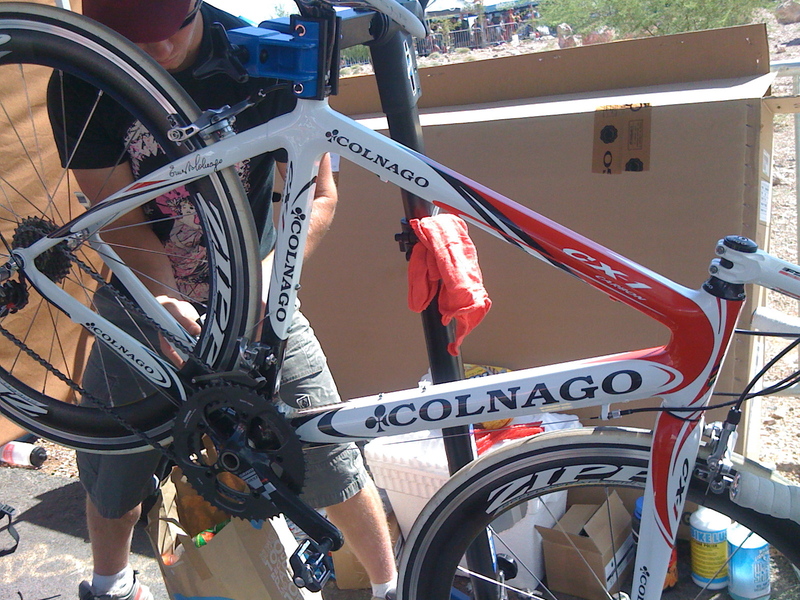 I’ve always wanted to try a Colnago, but this was the first opportunity I had. Wow, what a bike to start out with! After trying a couple of other meh bikes, I see a woman hop off the Colnago at the station so I rush up to see if I can try it. I ask if it’s OK to put on my stem, and after a small discussion, they allow it. Smart move, because I took it out on the loop, and I worked this bike. It fit, and it was a shockingly delicious geometry. Some of the best I’ve EVER ridden. Let me just say now that even though this is a “unisex” bike, it will be available in 50cm, 48cm, 46cm and EVEN 42cm(!!! ), so ladies, if you want this bike, there’s a size for you. The first thing I noticed was the stability on the downhill at speed (I hit ~ 40mph). With a rock solid front end, I could really push down on the bars, and the back end never wagged or lagged. On a flat road, I found comfort in all three classic hand positions; I could truly ride this bike all day long, with a smile. But this bike SHINES in a sprint or climb. Easily to stand and climb (or sit), and the bike stays with you, spry and playful on the Sprint. 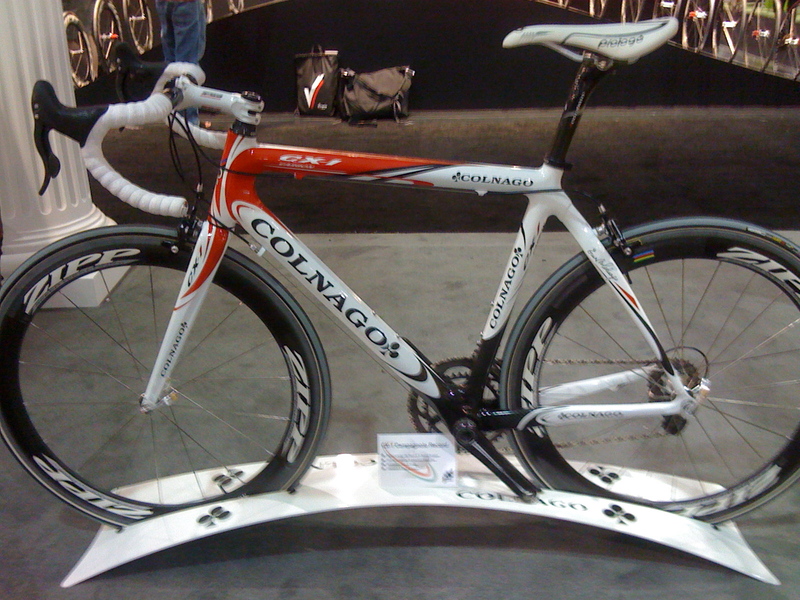 I would say that the only thing I did not love about this bike was the componentry (SRAM RED) which is not a fault of the bike, just a preference of “jewelry”, if you will. This year I’ve had the opportunity to test out MANY “Women’s design” bikes, including Trek, Cannondale, Specialized , Giant, and Look. This hermaphrodite is far and above, the best bike I’ve tested all year long. 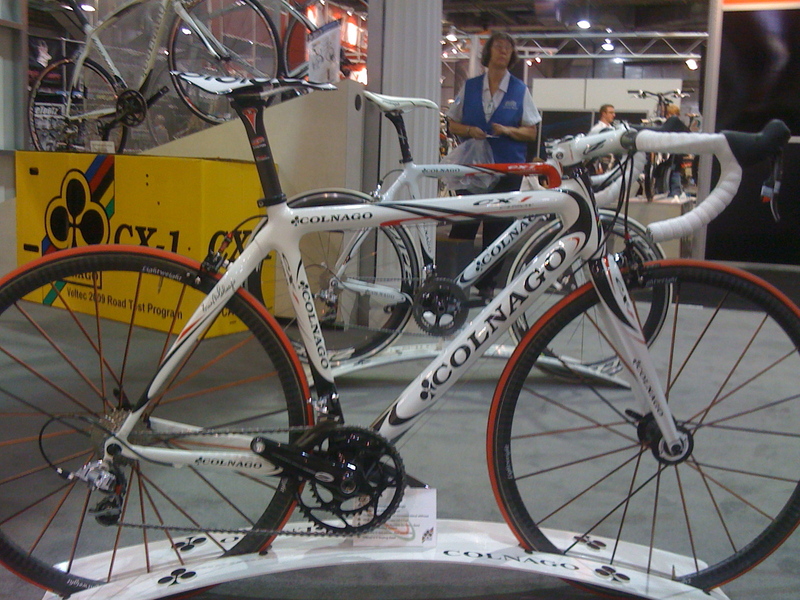 I’ll go to the Colnago booth tomorrow, and take more pictures of this beautiful beast. 0. Have Your Flat Kit With You… because, all the knowledge in the world won’t mean a thing without your, um, bike pump, for example. FLAT KIT – Bike pump (or 2 CO2 canisters and value attachment), 2 tires, 2 tire levers , patch kit, multi-tool, and disposible latex gloves. 1. Inspect the outside of the tire, to see if you can find what might have caused the flat. Road tires are pretty smooth, so by rubbing a finger gently again the outside of the tire, you might detect a piece of a thorn, glass, or radial tire wire*. 1. Take the valve cap and nut (if presta) off, and deflate the tire the rest of the way. This will make it easier to the wheel off of the bike, and make the bead easier to take off of the rim. Undo the brake caliper – that’s the little tab on the side of the brakes. Undo and loosen the quick release skewer. If it is the front tire simply remove the wheel from the bike. If the rear tire is flat, make sure that you are in the highest gear (that’s the gear that has the largest chainring and the smallest cog). This will put the chain in a position toward the outside of the bike. Now, remove the wheel (which may require grabbing the chain to move it out of the way- aren’t you glad you’ve got your latex gloves?). Pushing the bead back a bit with your finger, wedge your tire iron underneath the the bead, and pull it over the rim. Use 2 tire levers if it is on very tightly (Pedro’s are my favs). Hold the part of the bead that is over the rim with your thumb, push the tire lever away from you, prying the bead away from the rim. Remove the inner tube. Check the tire for debris, such as thorns glass or radial tire wires*. Blow up the new inner tube slightly just to give it some form. Place the inner tube inside the tire. Put the wheel back on the bike, making sure that the skewer is seated properly. 7. Tighten and close the quick release skewer. 8. Close the brake caliper. Check your work. Ride on.